BRACKNELL, UK — March 20, 2019 — NETGEAR®, Inc. (NASDAQ: NTGR), the leading provider of networking devices that power today’s smart home and small businesses, has introduced a new tri-band Wi-Fi 6 router, the NETGEAR Nighthawk Tri-band AX12 12-Stream Wi-Fi 6 Router (RAX200). The Nighthawk Tri-band AX12 (RAX200) is a powerful Wi-Fi 6 (802.11ax) router that uses three bands with a combined Wi-Fi speed of 10.8Gbps**. This provides the ideal solution for the growing needs of households with an ever-increasing number of connected devices vying for internet bandwidth simultaneously. Tri-Band Wi-Fi provides an additional Wi-Fi band to reduce congestion and provide a better-connected experience across multiple devices simultaneously. The latest Wi-Fi 6 technology provides four times* the amount of data capacity over that of the previous generation of Wi-Fi routers (802.11ac), also now known as Wi-Fi 5. Experts predict the total number of connected devices worldwide will expand to 50 billion by 2020, as more and more people use smart devices in the home, from voice assistants, connected speakers, security cameras, thermostats, and much more, all at the same time. It is also expected that nearly 45 million people across the US will cut the cord to rely solely on internet video streaming to replace their broadcast and cable television, which will place even greater demand on the already strained home Wi-Fi network. With its powerful 1.8GHz quad-core processor and support for multi-gig internet connections, the Nighthawk Tri-band AX12 router will help to keep up with the increasing internet speeds being delivered to homes. The Nighthawk Tri-band AX12 sets you up for faster speeds and latest Wi-Fi technology in the foreseeable future as computers, mobile and IoT devices adopt the latest Wi-Fi 6 technology, while continuing to support all of your existing Wi-Fi devices. The Nighthawk Tri-band AX12 can deliver more than one Gigabit of throughput to mobile devices that support 160MHz bandwidth. 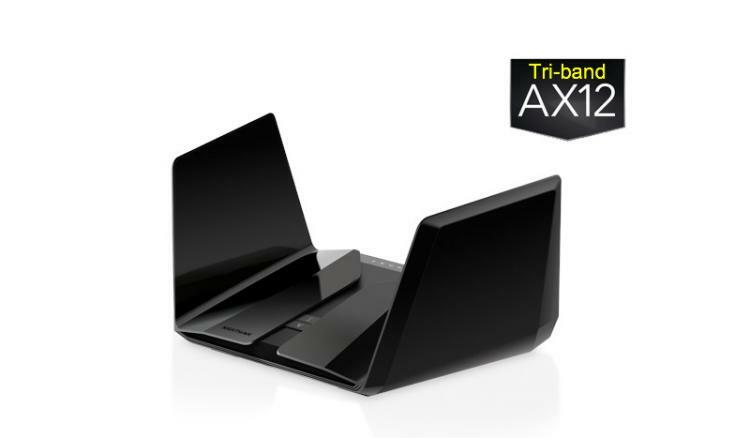 This next-generation Nighthawk Tri-band AX12 Wi-Fi 6 router design conceals eight high-performance antennas under the ‘wings’. The antennas are optimally positioned for best Wi-Fi performance and extend strong and reliable Wi-Fi coverage while providing a clean streamlined functional design. - 12-Streams Tri-band Wi-Fi – Eight streams of 5GHz and four streams of 2.4GHz means more available bandwidth and less congestion for all devices on the Wi-Fi network. - Smart Connect - Intelligently selects the fastest Wi-Fi band for every device connection. One Wi-Fi name for the entire home. - Nighthawk App - Easily set up your router and get more out of your Wi-Fi. Includes remote access to manage your network away from home. - Wi-Fi6 Optimised Powerful Processor - 64bit 1.8GHz quad-core processor ensures smooth 4K UHD streaming & gaming – ideal for Gigabit internet speeds. - Multi-Gig Ethernet Port 2.5G - 2.5 times the wired speed of a typical Gigabit port, to be used for LAN or internet connectivity. - Five (5) Gigabit Ethernet Ports - Connect more wired devices for faster file transfer and uninterrupted connections. Ability to aggregate two Gigabit LAN ports and two Gigabit WAN ports (configurable) concurrently. - Automatic firmware updates - Latest security patches delivered to the router. - Pre-optimised Antennas - Unfold and set antennas on the router, no further adjustment required. The AX12 antennas come pre-optimised for best Wi-Fi performance. - Dynamic QoS - Prioritises network traffic for uninterrupted video streaming for applications like YouTube®, Net&#64258;ix®, & others. The NETGEAR Nighthawk Tri-Band AX12 12-Stream AX1100 Wi-Fi Router (RAX200) is currently available for pre-order through authorised NETGEAR partners and other reseller channels, ecommerce sites, and major retailers. † Maximum wireless signal rate derived from IEEE standard 802.11ax specifications. Actual data throughput and wireless coverage will vary. ** To achieve Gigabit wireless speeds the network requires compatible devices that supports 160MHz channels. Intel Gigabit Wi-Fi enabled devices supported. Clients must also support 11ax standards.